Nearly every US city would like to be more walkable—for reasons of health, wealth, and the environment—yet few are taking the proper steps to get there. The goals are often clear, but the path is seldom easy. Jeff Speck’s follow-up to his bestselling Walkable City is the resource that cities and citizens need to usher in an era of renewed street life. Walkable City Rules is a doer’s guide to making change in cities, and making it now. The 101 rules are practical yet engaging—worded for arguments at the planning commission, illustrated for clarity, and packed with specifications as well as data. For ease of use, the rules are grouped into 19 chapters that cover everything from selling walkability, to getting the parking right, escaping automobilism, making comfortable spaces and interesting places, and doing it now! "Walkable City Rules is worth reading even for those of us who will never set foot in a planner's office. Like Walkable City, this book explains how a variety of laws and rules frustrate the person who wishes to get from one place to another on foot. But to a much greater extent than most books about walkability, this book tells readers what can be done to improve upon the status quo." "The book fairly explodes with practical and pragmatic ideas that civic communities, town planners, and especially the resident citizen should consider for the improvement and enhancement of their locale." "Has there ever been a smarter, more illuminating, jargon-free, and deeply useful guide to making more sociable, healthy, prosperous, charming neighborhoods, towns, and cities? Every local leader and every engaged local citizen owes it to themselves to read Walkable City Rules." Kurt Andersen, author of "Fantasyland" and host of public radio's "Studio 360"
"Filled with the photos, graphics, and charts that many of his fans felt were missing from the last book, the new volume comprises 1010 mini-chapters, each of which elegantly distills a single precept from his philosophy." "What a tour de force! The world needs this book so much right now. Walkable City Rules is sure to change the face of neighborhoods, towns, and cities around this country and beyond." Sarah Susanka, architect and author of "The Not So Big House" series and "The Not So Big Life"
"With Walkable City, Jeff Speck demonstrated that he is the most relevant writer and thinker of his generation on the subject of city planning. With his new book, Walkable City Rules, he establishes himself as the most helpful. There is no single document poised to have a greater positive impact on our communities and on the practice of urban planning than this comprehensive and engaging text." "Jeff Speck is a total rock star to me. He is a great planner, but his real gift is empowering people to reshape their own communities. There is a huge wave of us out there saying, 'Yes, I DO want to make my town more livable, walkable, equal, and fun.' Walkable City Rules is THE super-user-friendly resource to help us spring into action, wherever we are." Dar Williams, singer-songwriter and author of "What I Found in a Thousand Towns"
"If you want to make your city safer, healthier, greener, wealthier, and more equitable, then you need to make it more walkable. Walkable City Rules is a must-read for urbanists, city-builders, and everyone who lives in cities." Richard Florida, author of "Rise of the Creative Class"
"Jeff Speck, more than any city planner I know, writes about walking in such a common-sense and useful way that he makes you crave a good walk. He not only defines what it is, he eloquently shows us how to achieve it. Another great read, one that gives any city the necessary tools to create a good walk." "Jeff Speck has written the book our cities need right now; a practical guide for building the great places of tomorrow. This is essential reading for anyone wanting to make their place better." "I am a big fan of the phrase, 'walk before you run' and have applied it figuratively as a framework in business and government. In his influential practice, Jeff Speck applies it literally: places will never be truly great unless they are walkable, no matter what you layer on top, including technology. In this essential volume, Jeff lays out a comprehensive and interconnected set of 'Walkable City Rules' that, if followed by every city and town, would create a nation of happy citizens and superlative outcomes." Gabe Klein, cofounder, CityFi and author of "Start-Up City"
"Jeff Speck was the first to introduce me to the concept of a walkable city. With his help, Oklahoma City completely changed its outlook on the built environment and has now transformed itself into a completely different place. How we did it—and how you can do it, too—can be found in this important and compelling book." "In Walkable City, Jeff Speck outlined the many compelling social, economic, and environmental benefits that come from designing our communities for people rather than cars. With Walkable City Rules, he translates those principles into a concrete plan of action. From zoning changes to public transit investments and road repurposing to saving existing small-scale fabric, this timely and necessary book offers clear, concise, and step-by-step instructions for urban planners and leaders to transform neighborhoods for the better and reimagine their cities at a human scale." "America's car-focused evolution has accelerated epidemics of injury, inactivity, depression, and isolation. We must transform disease-promoting places into ones that are human- and health-friendly. Speck confronts this task and makes acrobatic what could be pedantic. He writes with humor and verve, but with substance from deep experience. A beautiful book, with superb organization, layout, photos, and writing, Walkable City Rules should be assigned reading for every elected official and every health and planning class in America." We know that walkable cities are desirable for so many reasons, including for our health and our environment. But what steps should cities take to become more walkable? Join author and urban planner Jeff Speck in a 90-minute webinar, co-sponsored by SSF and Island Press, to explore some of the practical rules that cities should follow to usher in a more walkable future. With his book Walkable City , urban designer Jeff Speck made a compelling case for walkable cities. With his follow-up, Walkable City Rules, he shares practical guidance for implementing walkability. Join this conversation to learn how your community can reap the environmental, health and economic benefits of walkable cities. Join urban and architectural designer Jeff Speck, popular author and TED Talk speaker, for an illustrated tour through recent projects featured in his new book Walkable City Rules, 101 Steps to Making Better Places. Speck hopes the book will be a resource that inspires cities and citizens to usher in an era of street life in America. Following the talk, Speck signs copies of the book. Jeff Speck is a city planner and urban designer who, through writing, lectures, and built work, advocates internationally for more walkable cities. As Director of Design at the National Endowment for the Arts, he oversaw the Mayors’ Institute on City Design and created the Governors’ Institute on Community Design. He is author of Walkable City: How Downtown Can Save America, One Step at a Time and the co-author of Suburban Nation: The Rise of Sprawl and the Decline of the American Dream as well as The Smart Growth Manual. Join nationally-recognized expert on building walk-friendly, people-oriented places, Jeff Speck, and Strong Towns President, Chuck Marohn, on Friday, November 9 at 12:00pm CT for a celebrity edition of Ask Strong Towns. 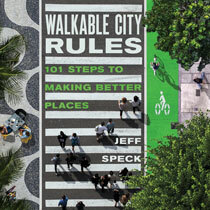 Speck is the author of the new book Walkable City Rules: 101 Steps to Making Better Places. He and Chuck Marohn will kick the webcast off with conversation about Speck’s latest project, the state of walkability planning nationwide, and how the practical wisdom packed into Walkable City Rules can help. And then Jeff will take your questions live. To join this member-exclusive webcast, become a member of the Strong Towns movement. Members, please check your email for your exclusive invitation, or email member support. Please note that space is limited and questions will not be accepted in advance for this webcast.